Egypt, during the reign of the pharaohs. At the royal palace in Memphis, the high priest Ramfis tells the warrior Radamès that Ethiopia is preparing another attack against Egypt. Radamès hopes to command his army. He is in love with Aida, the Ethiopian slave of Princess Amneris, the king’s daughter, and he believes that victory in the war would enable him to free her and marry her. But Amneris loves Radamès, and when the three meet, she jealously senses his feelings for Aida. A messenger tells the King of Egypt and the assembled priests and soldiers that the Ethiopians are advancing. The king names Radamès to lead the army, and all join in a patriotic anthem. Left alone, Aida is torn between her love for Radamès and loyalty to her native country, where her father, Amonasro, is king. She prays to the gods for mercy. In the temple of Vulcan, the priests consecrate Radamès to the service of the god. Ramfis orders him to protect the homeland. Ethiopia has been defeated, and Amneris waits for the triumphant return of Radamès. When Aida approaches, the princess sends away her other attendants so that she can learn her slave’s private feelings. She first pretends that Radamès has fallen in battle, then says he is still alive. Aida’s reactions leave no doubt that she loves Radamès. Amneris, certain she will be victorious over her rival, leaves for the triumphal procession. At the city gates the king and Amneris observe the celebrations and crown Radamès with a victor’s wreath. Captured Ethiopians are led in. Among them is Amonasro, Aida’s father, who signals his daughter not to reveal his identity as king. Radamès is impressed by Amonasro’s eloquent plea for mercy and asks for the death sentence on the prisoners to be overruled and for them to be freed. The king grants his request but keeps Amonasro in custody. The king declares that as a victor’s reward, Radamès will have Amneris’s hand in marriage. 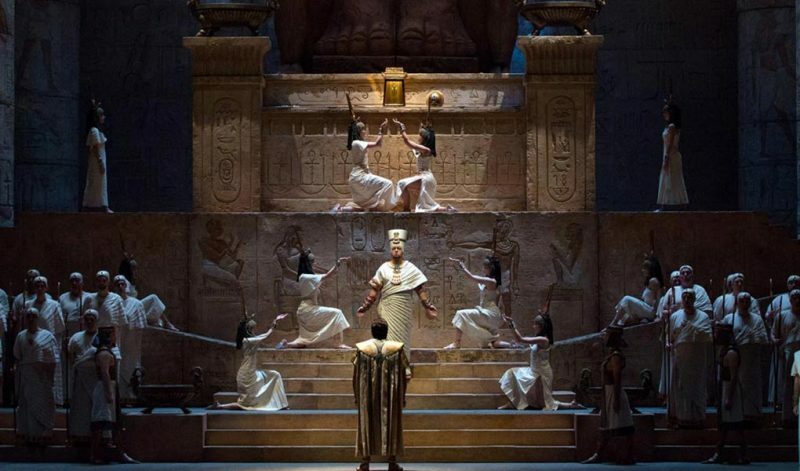 On the eve of Amneris’s wedding, Ramfis and Amneris enter a temple on the banks of the Nile to pray. Aida, who is waiting for Radamès, is lost in thoughts of her homeland. Amonasro suddenly appears. Invoking Aida’s sense of duty, he makes her agree to find out from Radamès which route the Egyptian army will take to invade Ethiopia. Amonasro hides as Radamès arrives and assures Aida of his love. They dream about their future life together, and Radamès agrees to run away with her. Aida asks him about his army’s route, and just as he reveals the secret, Amonasro emerges from his hiding place. When he realizes that Amonasro is the Ethiopian king, Radamès is horrified by what he has done. While Aida and Amonasro try to calm him, Ramfis and Amneris step out of the temple. Father and daughter are able to escape, but Radamès surrenders to the priests. Radamès awaits trial as a traitor, believing Aida to be dead. Even after he learns that she has survived, he rejects an offer by Amneris to save him if he renounces Aida. When he is brought before the priests, he refuses to answer their accusations and is condemned to be buried alive. Amneris begs for mercy, but the judges will not change their verdict. She curses the priests. Aida has hidden in the vault to share Radamès’s fate. They express their love for the last time while Amneris, in the temple above, prays for Radamès’s soul.